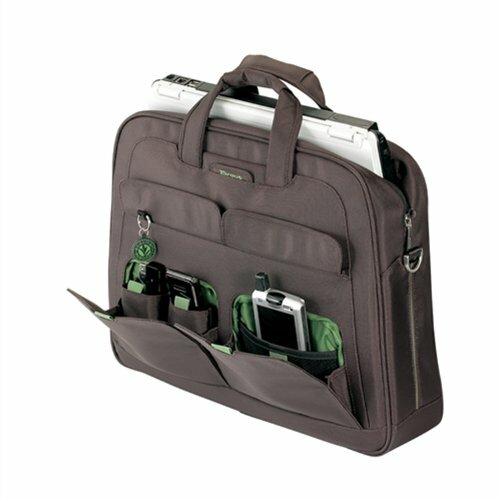 Targus TBT043EU EcoSmart Business Casual Top Load Sacoche pour Ordinateur Portable 15,4"
He targus ecosmart business casual top load is designed to fit laptops with 15 - 15.6 inch screens. As part of the targus green initiative, this laptop case is made from nylon which comes from recycled plastic (pet) with nickel-free metal fittings and magnets to help reduce the impact on the environment, both during and at the end of its lifecycle. In every aspect of the case design we have looked at ways in which we can help to support a more sustainable path for the future beautifully designed with angled lines and an easily accessed laptop compartment, this case is to get you noticed. Constructed in striking charcoal with subtle accents of colour provided by the green stitching and lining, it is ideal for executives with busy schedules. Keeping your belongings protected could not be easier as the case features a quilted laptop compartment. Large user friendly pockets for stowing and storing items help to keep you organised and the quick access front stow pockets with nickel free magnets are perfect for keeping essentials close to hand. The case features an adjustable/padded shoulder strap and padded handle for comfortable carrying. For added convenience the case includes a back slip pocket to store documents.